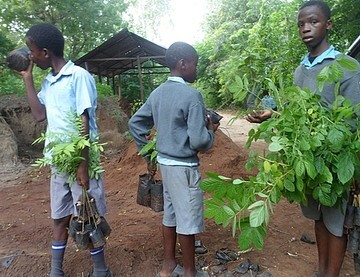 “Miti Kwa Vitukuu” meaning ‘tree is a heritage for our grandchildren’ project entails mainly capacity building on the importance of environmental conservation. The project goal is to stop logging without mitigation and promote afforestation as a tool for climate change mitigation targeting the future generation. The program fits in the organization’s overall vision of molding a generation that understands, respects and integrates human rights and the environment. 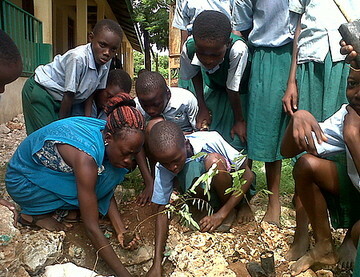 Through schools, CJGEA team has helped to set up environmental clubs named 4-K clubs. 4-K; Kulinda-protect the environment Kuhifadhi-to conserve the environment Kutetea-to defend the environment Kenya-our country The clubs’ participants are motivated to stay active by owning a tree they planted and taking care of it until it grows equipping them with important life values. Activities like clean up and tree gifting are encouraged. 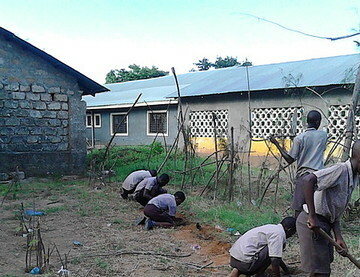 The members are made environmental scouts and future environmentalist through training on issues of environment. CJGEA published a curriculum that will help the young generation realize that despite the global modernization and industrialization, natural resources must be used thoughtfully ensuring sustainability. 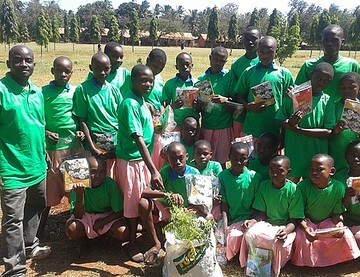 This booklet equips the young pupils with knowledge of environment, its importance and the need to take care of it.